Click the arrow and hear the show as you peruse pix below. Descendants of Cain–the “Indians”–ie, the Beardless Ones–crossed the landbridge between Siberia and Alaska met the Maya, a civilization that amalgamated Black, Semitic and new migrants (also descended from Cain) coming north from South America. 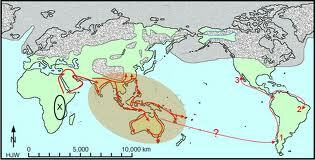 The Nibiran took newcomers from the Africa, the Middle East and Pakistan to South and Central America. The Indians coming south met the Indians coming north in Teotihuacan in southern Mexico over 10,000 years ago. 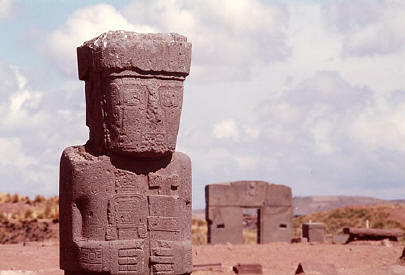 They built Tiahuanaco later with help from our Earthling ancestors from Mesopotamia, Africa and Pakistan–as well as Greys. Adad kept his aircraft in a base beneath Lake Titicaca [similar to the U.S. Grey-Military base beneath Johnston Atoll in the Pacific]. 13,000 years ago, Enki, Chief Scientist of the goldmining expedition from Nibiru to Earth, thwarted Commander Enlil/ (Yahweh). The Commander, at a Council of Leaders he convened in Sumer (Iraq), ordered death for every hybrid adapted worker-slave. He called our ancestors “Earthlings.” Enlil hid info about a coming astronomical disaster that would kill us all; he tabooed saving our species. Enlil said he’d let Nibiran miners and astronauts with families with us Earthlings know that soon Nibiru’s gravity as it passes Jupiter and Mars, would slide Antarctica’s icesheet into the South Sea. Waves would cover Mesopotamia. Millions of us Earthlings in the cities, goldmines, and South African power grid would drown. 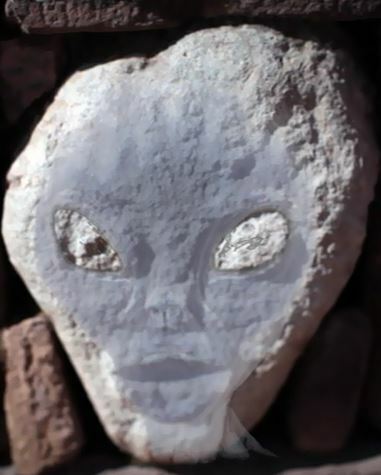 Nibirans with Earthling families, he said, must “Leave for high ground.” The Expedition bosses would ride out the flood in spacecraft or shelter on Mars or the Moon. But we Earthlings must, he said, drown in flood. “No Earthling survivors.” Enlil looked straight at Enki, his brother and rival. “Leak this to your pet Earthlings–the expendable short-term workers you engineered–and you’re dead. We won’t get out alive if Earthlings learn the flood’s coming and swarm of the spaceport.” The Commander further justified our extinction: our demise would put the Expedition into compliance with the Planetary Settlement no-slavery rule. We Earthlings, genetically Homo Sapien, just like the Nibirans (well, almost like them; they lack foreskins and are a few feet taller), yet Enlil lacked any empathy with or compassion for us. Enki, sister Ninmah and his son Thoth, engineered and, in Enki’s case, begat us. To adapt the Nibiran genome to Earth, Enki added a few Neanderthal/Erectus genes. Ninmah added copper, reddish-brown African clay to our genome. They wanted us smart enough to obey, but short-lived enough to accept slavery, for only a thousand or so Nibirans controlled millions of us. Enlil and the Nibirans saw us as disposable mine, farm, army and brothel units. When the ice slid, Enlil would achieve his goal: destroy us, the pet Earthlings Enki so lauded. We’d served our purpose: mining enough gold to cloak Nibiru. Now we must all die. Galzu, an emissary of the terraformers, gave Enki a computer program (called an ME) of a submarine in which at least the Earthling Noah, whom Enki had just begat with his Overseer’s wife, could survive. Enki realized Galzu was an emissary of the Prime Creator. Enki then chose to defy the Commander, but secretly. At Noah’s settlement in Iraq (Basara), Enki slipped the Galzu’s program into Noah’s wall-computer. Galzu directs Enki’s arm tossing the data program for the submersible to Noah’s computer bank. Enki is shown upon his snake symbol. 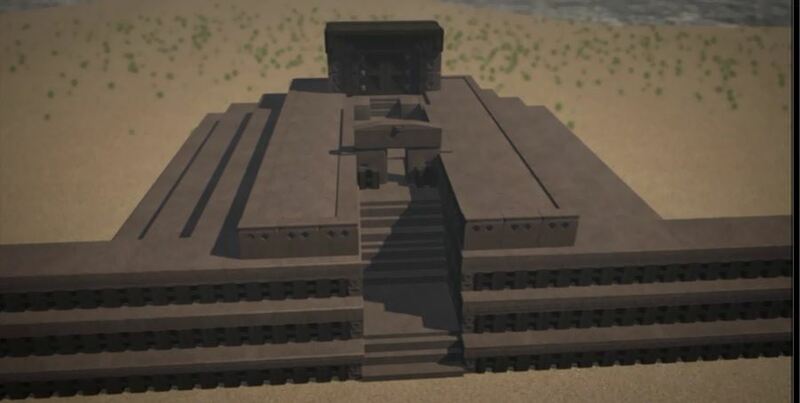 Enki told Noah to say, “My people build this boat to sail to Enki’s place in Africa [Great Zimbabwe].” When Noah and his clan finished the sub, Enki’s Nibiran son, Ninagal, came to pilot it. Ninagal surfaced, raised sail and steered to Mt Ararata (Turkey), where Ziusudra built a huge signal fire and roasted a lamb to honor Enki. 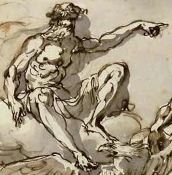 Enki implored the Commander, “’Noah is no mere mortal, my son he is,’ Enki to Ziusudra [Noah] pointing. `To a reed wall I spoke, not Noah.‘” Ninurta and Ninmah restrained Enlil. Enki told them the Creator-of-All made him save the Earthlings. Enki’d seen Galzu, messager of the Prime Creator, in a dream. Then, said Enki, when he woke, next to his bed he kicked a tablet from Galzu. The tablet, which Enki downloaded into the ME he put into Noah’s wall, showed Noah how to build the submersible. Enlil, when he found out that Nibiru had also, in its nearing Earth, lost it’s cover of white powder of monoatomic gold and now Nibiru wanted more gold from Earth, pardoned Enki. Enki and Enlil coordinated their efforts to repopulate and resettle Sumer and to get more gold for the homeplanet. [ZS, Enki: 228 – 229]. Enki’s youngest son, Adad,(also called Ishkar, Tehub, Viracocha, Hadad, Raman, Rimac and Thunderer) ruled the Hittites of the Near East. 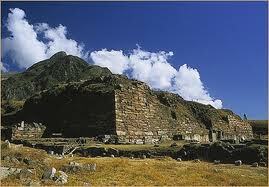 He recruited metallurgists from the Hittites for the high altitude facilities in the Andes. 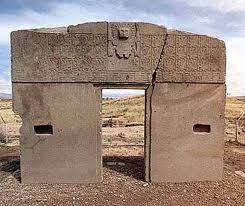 The Gateway in Tiahuanaco to nearby Pumapunku Basecamp; Viracocha, above gateway, is surrounded by Igigi astronauts. 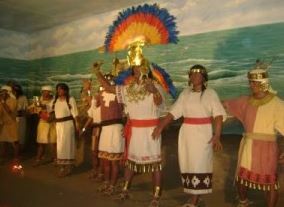 Ninurta brought more Beardless Ones to South America. He rounded up those who survived in the mountains of Eurasia and he had them build a balsa raft fleet. The fleet crossed the Pacific. The fleet commander, Naymlap, in the lead boat, held a green stone–a speaking GPS. A Nibiran voice broadcast from the stone the fleet, gave sailing and other instructions across the Pacific to Cape Santa Helena, Equador. 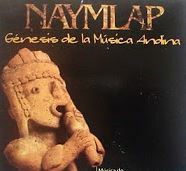 Naymlap, guided by green stone communication device. 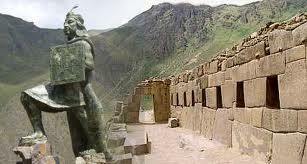 The voice from the stone continued on land; it ordered the “Indians” up the Andes. The communicator told them how to farm, build structures and make handicrafts in their new home. 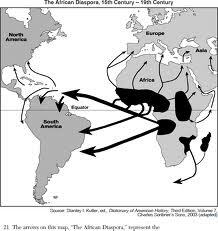 Adad had the newcomers help build the cities and airports of Pacific and Gulf South America. He put them to work in his tin factory at Tianhuanco. 40,000 people or so lived at Tiahuanaco. 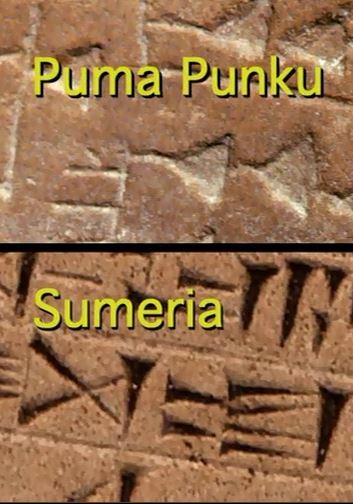 Enroute across the Pacific to South America, migrants engraved rocks with the script they used in Sumer and South America. 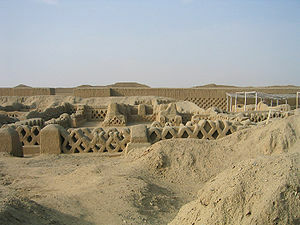 The Nibirans taught us to make bricks of Sumer’s mud. They showed us how to make tin into bronze, an alloy that could work the hard diorite-panels with which we faced the mud bricks. With bronze we made weapons and tools. But “Few and lofty were the Anunnaki who from Nibiru had come, few were their perfect [genetically unmixed with Earthlings] descendants. How over Mankind lofty to remain, how to make the many the few obey and serve. About all that, about the future the leaders with King Anu on Nibiru words exchanged. To come to Earth Anu decided.” For Anu’s visit to Earth, they built Unug-ki, a temple in Uruk where neither Enki nor Enlil ruled. 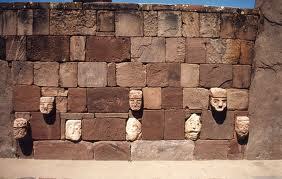 On his sixth day on Earth, Anu called Ninmah, Enlil and Enki to the palace they’d built him. There, Enlil told Anu of abundant gold in the Andes. Anu decreed four regions on Earth, three–Sumer, Egypt and Africa, and Indus Valley–whom Ziusudra’s descendants would govern for the Nibirans; one reserved for Nibirans. Region 1: Enlilites’: Enlil and his lineage named kings, men descended from Noah’s sons, Shem and Japhet the Fair, through whom they ruled Sumer. By 7400 B.C., Shem, and his successors ran nations from the Persian Gulf to the Mediterranean. 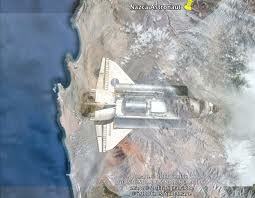 Around 3800 B.C., Shem’ s descendants settled the ex-spaceport area of Iraq and the Landing Place at Lebanon. Japhet’s issue ruled lands in Asia Minor, the Black and Caspian Sea areas, as well as the nearby coasts and islands, as they recovered from the flood. Region 2: Enkiites’: Anu said Enki and his descendants would rule Egypt and Africa though successors of Ziusudra’s son Ham the Dark. Ham’s line ruled Canaan, Cush, Mizra’im, Nubia, Ethiopia, Egypt and Libya from the highlands and spreading to the reclaimed lowlands. 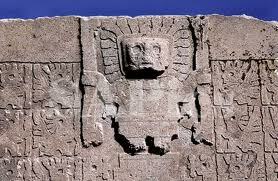 Anu ordered Marduk from exile in North America to Tiahuanaco. Anu’s predecessor Alalu had long ago married Enki to his daughter Damkina and she bore Marduk/Ra. Though Alalu and Anu agreed Marduk would succeed Alalu as Nibiru’s King, Anu deposed Alalu. 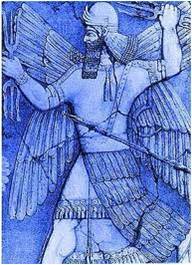 Marduk enraged Nibiru when he married hybrid Adapite Earthling, Sarpanit. Then Marduk supported the Nibiran Astronauts when they seized 200 Earthling wives and at Baalbek, the pre-flood Landing Platform in Lebanon. 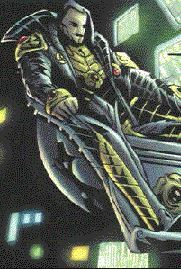 The Nibiran Council punished Marduk: banned him from the homeplanet and forbade him to ever rule there. After Anu and Antu flew back to Nibiru, their rocket filled with gold, Marduk raged at the regions of influence Anu gave his rivals. 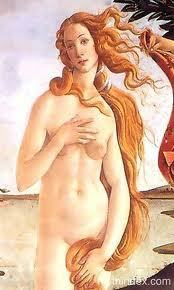 Marduk said Inanna blamed him for Dumuzi’s death which she herself caused. Now, Marduk whined, Inanna consorted with Anu, who gave her reign over the Indus Basin, as well as Uruk. Enlil told Adad to guard the Enlilite South American facilities from Marduk while the other Nibiran Earth Mission leaders returned to Sumer. When Sumer’s tin supply in Bohemia and Saxony along the Danube ran out, Adad brought his Cassite metallugists from Asia Minor to the bronze works around Lake Titicaca–Huanaco and Tiahuanaco. By 2200BC, the Andes produced all the tin Eurasia needed. Adad’s cousin Thoth (known in the Americas as Quetzlcoatl or Kukluklan) “and his African followers worked with Adad to built an observatory as well as bronze and gold-processing sites around Tiahuanaco. They created a huge landing platform at Ollantaytambu. Thoth and Adad planned the Andean cities in visual grid from Tiahuanaco. 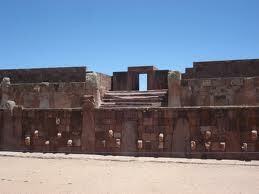 Tiahuanaco gave pilgrims a shrine, to behold Pumapumku, landing place of the Nibiran gods. 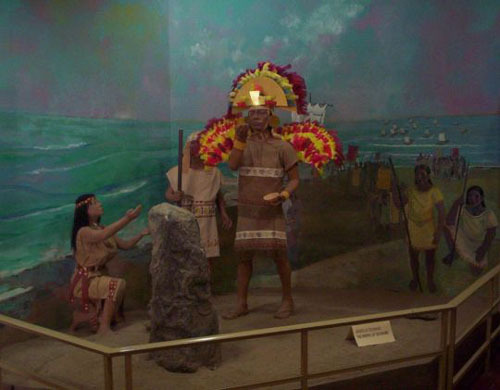 Representations of Tiahanaco’s pilgrims remain in its remains. 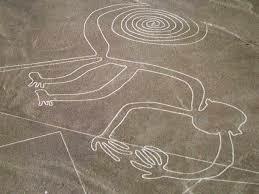 Evidence of Nazca, the last Nibiran spaceport on Earth, includes 740 take-off trails atop huge scraped drawings [geogylphs] of “known and imaginary animals and birds made by removing the topsoil several inches, executed with one continuous line that curves and twists without crossing over itself. Attempts to show that a horde of workers working at ground level and using scrapers could have created these images failed. 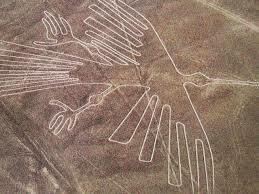 Someone airborne used a soil-blasting device to doodle on the ground below.“The feet-deep ’Candelabra’ in nearby Bay of Paracas was obtained in the same way” by aircraft “equipped with some ray gun gizmo.